This is the year of refreshing old skills. Sewing , like watercolour has been long abandoned. My mum was a brilliant seamstress and made fantastic clothes and costumes throughout the sixties and seventies. I learnt loads from her but never really used the skills and ended up just about competent to turn a hem. In time her wonderful, but heavy, 70’s Brother machine, found its way to the tip. A couple of years ago my ex- husband bought me a lightweight, new Brother. Nothing like as swanky as the old one, but how much tech do you need to turn up hems? Sewing Bee came on the TV, originally, when I was still working stupid hours in London, then early this year it was announced that it would return in the late winter after a gap of a couple of years. No longer having erratic hours and on-call as an excuse, I enrolled on a sewing course to gain some Sewing Bee chutzpah. https://www.makeat140.co.uk/ is a gorgeous fabric and sewing stuff store at the Royal William Yard. Lizzie Evans the happiest of haberdashers, ran a successful business from an old mortuary in the Barbican area of Plymouth. 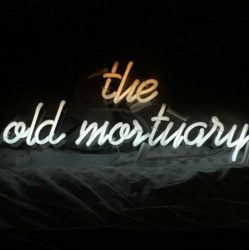 Old Mortuaries are a bit of a thing around here, there’s us, Lizzies previous incarnation, a bakery and a bar running in old mortuaries locally. Anyway I digress. Make at 140 moved to its new location recently and now has the fabulous spaces at Ocean Studios in which Lizzie can run her courses. I did the beginners course. Our course was taught by Jackie, an enthusiastic teacher with five years experience of home sewing. My group of novices were a group of women ranging in sizes and ages. We were all pretty focussed on producing the two items being created during our five week course. The first, a tote bag, taught us basic pattern use and sewing machine skills. The first class also covered the anatomy and physiology of a sewing machine and the tools needed for a basic sewing kit.After the Tote bag we quickly progressed onto making an actual garment. We were really well supported by Jackie, who is endlessly patient and encouraging. Lizzie was also there every Tuesday , sometimes supporting other groups or classes but always there to make half time beverages, comestibles and to share her sewing wisdom. At the end of week five I had a strong and useful tote bag and a top that actually fitted me. There are loads of follow-on courses to join but I decided to take some time out and make some mistakes at home before returning for advanced stuff later in the year. First up in my mistake plan list was a Merchant and Mills pattern, euphemistically called 101 Trousers. 101, has come to represent basic, simple or easy, but my take on 101 has always been more about George Orwell’s torture chamber in his novel 1984. As it turns out the trousers straddled these two meanings rather effectively. My big error was buying a fabric that was the same on both sides. Hannah my partner chose a lovely botanical fabric with a plain reverse side, she had a much easier time of it. My choice gave me ample experience using an unpicker. On reflection the pattern probably was foolproof but we just took foolish to higher levels than it could accommodate. Eventually after using a months supply of the f**k word, copious tea and YouTube gazing we produced two lovely pairs of trousers, with pockets, that we will wear with pride in full daylight amongst people we know. That is high praise because we are a fussy pair. I’m already planning my next garment on the mistake plan. I’m confident that my new found basic/ beginners skills will ease me towards less mistakes and more confident seamstressing and then on to the next course at Make at 140. For everything else there is YouTube . Home made pattern weight using recycled fabric swatches and ribbon from Christmas gifts. A lot has happened in the last 6 months. A sentence that explains and excuses the hiatus in my blogging. The thing I have been able to stick with, in that time, is my lessons in the dark-art of water colour painting. Apart from holiday dabbling there have been forty years between my serious attempts at watercolour. In those years there has been sculpture, pottery, land art, oils, acrylics, palimpsest and collage. My suppliers are mostly independents. The one exception to that is a brand that bombards me on Facebook. My products of choice are Isaro Watercolours. Handmade in Belgium by Isabelle Roeloffs a colourwoman with generations of experience. Her story can be found on the Isaro link above. I buy them direct from her or from Jackson’s art supplies. Dr PH Martin’s Hydrus Fine Art liquid watercolour. I can order these at Plymouth’s fabulous art supplier The Artside or from Jackson’s on-line or their own site, link above. The last of my trio is Arteza watercolour pens, bought direct from Arteza via Facebook. Any papers, sketchbooks, putty rubbers etc come from The Artside. They also provide a great printing service. Let’s start with the actual watercolours by Isaro. I love these paints, partly I admit, because of the romance of their production but also because they perform beautifully when used traditionally. What blows me away is that they are robust enough to use with unusual applications. Let’s not pretend these are as tough as acrylics but they go from subtle to vivid with ease . Wet on wet can be magical especially with unusual colour pairings.They respond superbly to the watercolourists guilty secrets, cling film and bubble wrap. The special effects can be subtle and vivid within millimetres of one another. Talking VIVID as we were moments ago Dr P H Martins Hydrus watercolour is the go-to for pop and glaze. I loved the effects I got with it when I painted the views of the walk home from a hard nights on-call at BartsHeartCentre. I use Dr PH Martin’s when I’m a bit timid about saving a painting when it is heading in the muddy direction. A quick layer of Hydrus can make a painting sing, and get me back on track. Fabulous paints are one part of the story, skill and technique are the things that need to be honed now. I’ve had some lucky breaks but fruits that look like a fanny and a sheep that could be a rockstar are moments to reflect on. Loose is the word most often bandied about in watercolour classes. By taking a slightly mixed format approach I think I would use the word serendipity alongside the ‘L’ word. I love to watch these slightly different watercolour formats jostle with each other on the paper. Sometimes they do half the creative work for me. And finally an old school friend , Fred, we knew each other years ago when I was first taking tentative steps into watercolours. Social media keeps us in touch, I painted this from a photo on his Facebook page, this portrait is the first I have attempted since my delayed return to the medium. this was painted just using Isaro watercolour in Sepia. I love the word glut, even though it’s harsh and ugly in sound and shape, it reminds me of the fecundity of autumn, lush and abundant with harvested produce. It’s meaning is an excessively abundant supply or to satisfy fully. The last weekend of September in Plymouth had an outrageous glut of arts and culture. Three different arts organisations included this weekend in their programmes. Drawn to the Valley , straddles the area adjacent to the Tamar Valley. Predominantly featuring ‘Open Studios’ the work of just under 100 artists was available for 8 days, finishing on this weekend. Plymouth Art Weekender also has some open studios , but it also features performance art, sound art and interactional art experiences over 63 venues all over the city. Events started on Friday evening and carried on until Sunday afternoon. The Atlantic Project is three weeks of an International Festival of contemporary art starting on this weekend with sites both indoors and outdoors across Plymouth. With so much to do and so little time to do it in the weekend passed quickly. Flashes of recycled plastics in a green and white funeral-like procession with discordant music. More discordant music and watery sounds. Amazing enthusiastic people doing their thing everywhere. It was a brilliant weekend. I could list the stuff I saw but that would be very dull. I’m going to write about three artists, one from each organisation. They happen to all be women but that’s a coincidence . I also saw some amazing work from men. Drawn to the Valley- Jill Coughman Open Studio. Jill was one of my art lecturers , she is inspirational. I’m drawn to her work even when I don’t know that she is the artist. Much of Jill’s work is autobiographical, it is emotional and evocative of both herself and her environment. Even tough subjects feel safe to explore through Jill’s response to them. I bought a print of Dockyard Blues. I love it. The group comprises both graduate and post graduate students from Plymouth University. Juliet’s work was stunning. Her title Heroes gave no hint of the works definitive topic but a bike outside embellished with flowers and ribbons in the colours of the Women’s Suffrage Movement was a not so subtle hint. Inside her installation, 100 discs laser etched with the names of imprisoned suffragettes hung on fine thread . The discs represented the medals awarded to all of these women who had endured participation in Hunger Strikes.Illuminated, they cast typography shadows on the walls or flashed a quick bright reflection into the viewers eye. It was mesmerising to look for familiar names but also intriguing to catch the names of people not so well known. The small scale of the Perspex discs massed together as an installation were a fabulous representation of the power of combined and cohesive effort. Chang’s work was the only one that made good use of the phenomenal setting that is the Melville Building at Royal William Yard. The other works in this building made no use of the industrial sized epic architecture. Such a shame for them . It would have been amazing to see work projected onto those beautiful walls. Thankfully Heavenly, Corrupted Landscapes has the scale and impact to drag my eyes away from the internal architecture . Her massive canvases owned the space. Referencing traditional Chinese landscapes from the Ming Dynasty the image is created using microscopic photography of the bacteria that is polluting four rivers in South Korea. The Atlantic Project runs until 21 st October. Art events like the three mentioned are not all about planning. Serendipity and missing things is also part of the experience. I missed meeting Nikki Taylor www.nickitaylorscupture.co.uk . I’ve loved her mesh sculptures since seeing them in London and was thrilled to find out she works from a studio in Plymouth. When I popped into her studio she was knee deep in great conversations , so actually I got no closer to talking about her work than I ever have in London. It’s always good to run into people unexpectedly, and really great when you can connect people from different parts of life. I met a Fine Art PhD artist who was studying the seaweed of Devils Point. www.duncantheartist.tumblr.com that’s pretty specialised stuff but coincidentally I have another friend whose Biology PhD covered the exact same topic. Surreal things happen, in a good way,when you talk to strangers at art exhibitions. Apologies to Duncan, every photo I took chopped your head off. So there we are, a seasonal glut of art and culture. All showcased in great venues surrounded by beautiful scenery and radiant sunshine. Summer slipping into autumn with a huge creative Boom! Being a Thursday child I’ve been about a bit. However for nearly thirty years Plymouth has been my nearest City and the area that I return to even after long sojourns. My relationship with the city is mixed, initially I was a little ashamed to say I came from Plymouth. My reasons were complex then but I’ve grown to love the city and really want the best for it. Aditya Chakrabortty wrote a brilliant piece in The Guardian, recently,that reflects where the city is at right now. A group of Bloggers were invited to the Crowne Plaza in Plymouth to meet with some of the people and organisations who are keen to promote Plymouth and its increasingly vibrant cultural and creative life. If anyone is in any doubt that Plymouth is on the up then curiously the Crowne Plaza is a good place to start. Big organisations are wise when investing large chunks of money, they do their research. Crowne Plaza has invested 5 million pounds in reimagining the old Holiday Inn. It is a remarkable transformation. 30 years ago my very first night in Plymouth was spent there, the only thing that lifted my heart at the time was the view from the room hosting the breakfast buffet. That same room is now the latest iteration of the Marco Pierre White group of restaurants. Beautiful, louche, photographs of the eponymous chef fill the entrance. Once inside the place is so stylish and glossy with those amazing views it’s hard to think that you are in Plymouth rather than a world renowned iconic city. (Iconic City is of course exactly what Plymouth wants to be) Anyway I digress. My point is that Crowne Plaza have invested in their Plymouth Hotel because they believe that Plymouth is going to become pretty amazing. The Bloggers event was held in one of the meeting rooms. In common with the whole interior of the Hotel the room had some pretty interesting artwork. Inky Blue is the signature colour of this hotel. Usually when Plymouth Bloggers meet we eat and talk, last night there was talking to be followed by cocktails and canapés. Luckily the quality of the talking took our minds off this unusual turn of events. Sally from Onshore Media introduced us to the movers and shakers of the Plymouth P R machine. I imagine there is no such thing as an effective, yet lack lustre PR, I was impressed that Plymouth has such engaging and dynamic representatives , vividly explaining where this, somewhat overlooked, Port goes next.The point of this initial meeting was to explore where blogging and PR merge and how they can be mutually supportive. I find this whole thing really interesting, finding things in Plymouth that fit naturally into the general theme of my blog will be fascinating. Cocktails and canapés, beautiful views of a great city, nothing more needs to be said. Thanks to Lauren Rogers from Crowne Plaza for hosting, the bar has been raised for future meetings.